Restoring functional and metabolic peace to a body in chaos is not a matter of “fixing” a health problem. It’s about hearing and honoring the physical, psychological and spiritual messages of the body and then leading the whole system back to balance. That’s where most doctors and health practitioners miss the mark—and it’s what makes our E3 Restore Program unique. Our E3 Restore Program treats the root causes of your dis-ease and enables the lifetime of wellness you deserve—no matter how impossible that may feel right now. You’re running after symptom relief but never feel truly healthy. You’ve worked with countless practitioners. You’re constantly trying to be heard, but feel like your voice is not listened to and your feelings are never truly empathized with, believed in or validated by your practitioners. You haven’t experienced the continuous individualized nutrition leadership and mentoring you need to heal your unique body. You feel fed up and wonder if your vitality will ever come back. Then we’re so glad you’re here. Every day we’re asked how we’re able to achieve remarkable results even for patients who’ve “tried it all” and struggled for years with thyroid and autoimmune dis-ease. Our diagnostic nutrition and holistic health practice blends clinical expertise with so much more. Not only do we offer a comprehensive understanding of thyroid, autoimmune and metabolic imbalance based on our professional and personal experiences, we also stand apart in these ways. Centralized Two-practitioner support model that replaces your nutritionist, practitioner, psychologist, trainer and gym – save your time and money! Complete, lasting physical, mental, and spiritual transformational outcomes – you’re done after your program! Working with E3 Energy Evolved begins with this comprehensive, holistic one-hour phone or Skype session between you and both health practitioners in our practice. During the E3EE Functional Health Assessment, we’ll dive deep into your “body story,” current nutrition, psycho-physiological, & energy stressors and history of healing efforts. We’ll offer an assessment of your current health, explain our recommendations for going forward and give you an estimate of the time and cost involved in healing your specific imbalances. If we find during the E3EE Functional Health Assessment that you’re a good fit for E3 Restore, our bio-individualized mentoring and treatment program, we’ll offer you one of the limited spots in the program. We bring science, energy & psychology together for true healing. Your lab results are only as good as the person interpreting them. We see physical markers of imbalance and connect dots that few other clinical practitioners understand. Treatment plans tailored to your unique constitution and imbalances. A completely online clinic, clients work with us remotely from the comfort of home—conserving their energy and maximizing rest. Discover the deeper why behind dis-ease and release emotional patterning that can stall healing. You may see changes within days of starting your restoration program, while other improvements will require weeks or months. Gain knowledge and tools to protect your health for years to come. Our E3 Restore Members are supported by a two-practitioner model, featuring a Diagnostic + Functional Nutritionist and a Mind-body Psychology Coach with expertise in functional and metabolic optimization. This pairing of skills allows us to support you from the clinical aspects of natural thyroid, autoimmune and metabolic restoration as well as nutrition, mind-body psychology, wellness, detoxification and spirit-based healing. We’re driven by our vision of ideal care and want our clients to expect and receive exceptional care from our time. You deserve greater outcomes than you’re currently experiencing and can count on us for the care and leadership you need. 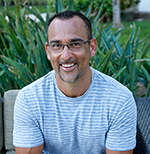 Damian Dubé, BS, CNC, FDN, CES, CPT, FMP Candidate, is a Functional Nutritionist, Certified Nutritional Consultant, Functional Medicine Practitioner (pending), retired NPC Bodybuilding Athlete & Contributing Expert Magazine Writer with almost three decades of experience, and Co-Founder of the e3 Energy Evolved™ System. 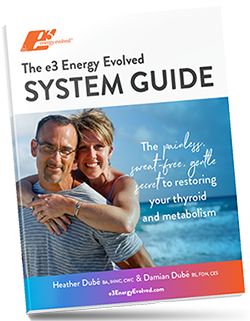 Heather Dubé, BA, INHC, CWC, CPT, NC Candidate is an Energy Medicine & Energy Psychology Practitioner, Functional Nutritionist, US National-Level Natural NPC Figure Athlete & Contributing Expert Magazine Writer with almost three decades of experience, and Co-Founder of the e3 Energy Evolved™ System. "As soon as I felt a shift in my health on your program in the right direction for the first time in years, I dug in! I watched my inflammation disappear with less exercise and the right foods for my body. What you guys do is essential! You are a blessing to me. It feels really great to thrive with less. I am grateful you are alive today to share your story, and are doing this work for others! It is incredible how far you have come in your own health recovery. I am seriously amazed at your own transformation and the work you did, now doing this work myself. I have watched my inflammation finally disappear with less exercise and the right foods for my own body. That chronic cycle of diet and over exercise is such an unhealthy place to be!!" "I feel AWESOME! I came to you for weight loss, but what you offer is so much more! I'm no longer fatigued. I have the energy to workout again. All my health annoyances are gone. I no longer have dandruff, or my ganglion cyst, eczema or depression symptoms. I would go 3 months without a period. Doctors told me I needed drugs to get pregnant. Now I have a regular period again. I can't believe how easy it is to lose weight with what you've taught me, and no deprivation. I lost 8 lbs resting! And, I thought I already knew 'enough' about nutrition before I came to you! This program was worth more than I ever imagined for my entire family. The greatest gift you gave me is knowing it's not about weight loss." "I cannot thank you enough for creating an individualized program for me that healed my body from 2.5 years of steroids & 4 years of immunosuppression (due to medical treatments.) I've been in autoimmune remission now for 2 years now & grow stronger daily." "This lifestyle change has changed my life! It was a step I will forever be grateful and thankful that I made!" We know what it’s like to feel trapped in a chaotic body. Read our story here to learn how we walked that winding, exhausting road ourselves. We’ll create a simple, cost-effective, direct path to healing—and help you protect your health for life. Don’t wait to apply for the E3EE Functional Health Assessment—the first step to working with us – and miss your opportunity this year to let true healing begin. Because we work in such a close and continuous way with each patient, we can accept only a limited number of people into our E3 Restore Program each year. As millions worldwide are now grappling with thyroid, autoimmune and fatigue-related disorders, available spaces fill quickly.